My detailed representational artwork has sometimes been described as “photorealism” or “high reality”. At openings, I have frequently heard the comment. “It looks like a photograph”. Although I do take reference photos and use them while I work, a filtering process of selection and interpretation takes place from the time I compose my photo to the final completion of the artwork. In “Edited Realism”, my objective is to show my particular version of “truth” as convincingly as possible. 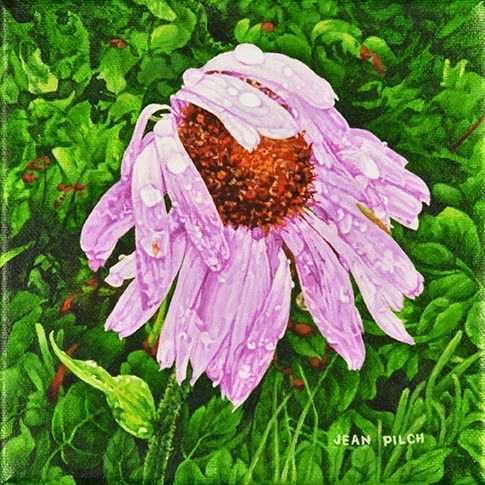 View Jean Pilch's paintings and pastel works in Gallery B until May 30, 2015. Showing simultaneously in Gallery A are Gerald St. Maur's charcoal drawings in "Searching skies, Seeing through trees". Visual Arts Alberta Gallery is open Wed-Fri from 10 am-4 pm and Sat from 12-4 pm. The Gallery will be closed on May 16.